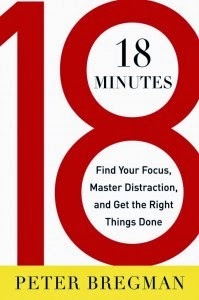 I stumbled upon 18 Minutes: Find Your Focus, Master Distraction, and Get the Right Things Done by Peter Bergman at my local library last week. 18 Minutes! A unit of time! Yes, I'm a sucker for that kind of thing. So since it's December, and I have nothing to do, I picked it up. It's hard to say just what 18 Minutes is. It definitely doesn't deal specifically with managing time. There's lots in the first half of the book about things like finding ways to make your weaknesses work for you and ways to pursue your passion. I'm a little past the halfway point, and I haven't hit on anything about 18 minutes. I will admit, though, that I'm doing a lot of skimming. The short chapters with a carefully written summary at the end make that easy to do. Still, I haven't seen a lot that's new here. Bergman does write about using a year as a unit of time and planning for same. That's appropriate for my purposes because on New Year's Eve I'll be doing a recapitulation post for this year and early in January I'll be doing one on goals and objectives for next year. One twist Bergman brings to the yearly discussion is making sure your daily plan relates to items on the yearly plan. That's something I could be more conscientious about with my situational planning. He also writes about deciding what you're not going to do. We've talked about this a bit here in relation to recognizing the things we aren't likely to do, accepting that, and not wasting time and energy on them. Again, this is something to be thinking about while pulling together goals and objectives for next year.